There are some food combinations which are classics and are also simply heavenly. One such combo must be chocolate with orange. Seriously, it is one the best. 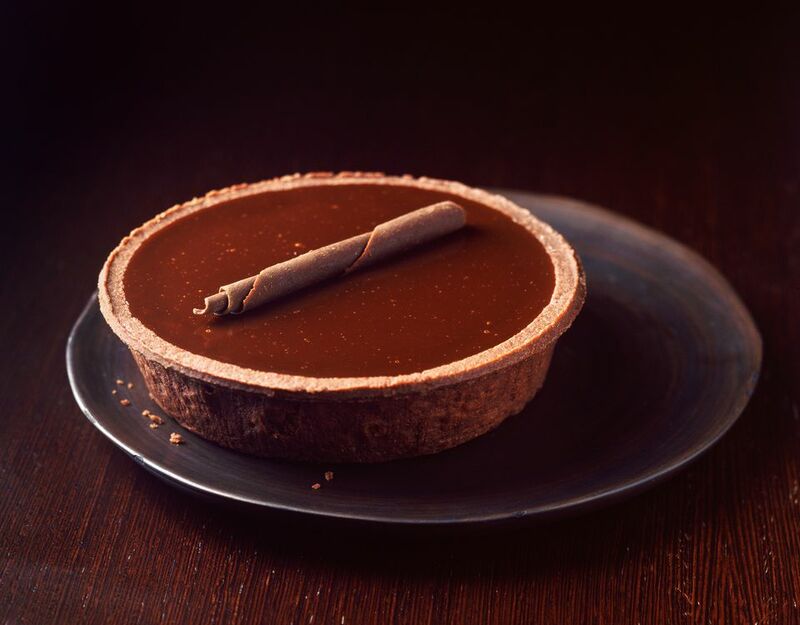 This rich, decadent Chocolate and Orange Tart brings the two together into one those heavenly moments. Even a petit four sized serving of this tart recipe is enough to satisfy the most ardent sweet tooth. The tender, buttery melt-in-the-mouth pastry shell is blind-baked (baked without a filling) and then topped off with a luscious, citrus-laced chocolate ganache filling. Serve it with a mellow café au lait for a complete dessert course. Fit the circle into the bottom and up the sides of the pan. Line the dough with pie weights or dried beans and bake it for 15 minutes. Remove the pie weights and bake the shell for an additional 5 minutes. Set aside the pastry shell, still in the tart pan, to cool. In a small saucepan set over low-medium heat, bring the cream and orange zest to just simmering. Remove it from the heat, and stir in the chocolate, Grand Marnier, and vanilla until the mixture is smooth and the chocolate is completely incorporated. Whisk a small amount of the hot chocolate cream into the eggs. Transfer the tempered egg mixture back into the hot chocolate and whisk the mixture until it is smooth. Pour the orange chocolate filling into the prepared pastry and bake it for 18 to 25 minutes, until most the filling is set and only the center jiggles slightly when the tart is moved. To decorate, how about adding a few chocolate curls? This chocolate orange truffle tart recipe makes 8 to 10 servings. The beauty of this tart is it can be made in any size to suit. Make individual tarts for a sophisticated dessert. You can also make the tart in tiny petit-fours tins for a party or celebration. Roll the pastry according to the size you wish to make.